How do I create a group discussion in a course? Groups are a subset of a course with a course-like environment including their own Calendar, Discussion board, and Collaboration tools. Only students added to a group have permission to see and use the respective tools within the group. A group discussion assignment creates an identical discussion topic in each group category. When students reply to the discussion topic they do so within their group environment, which is linked to the course from which the assignment was created. 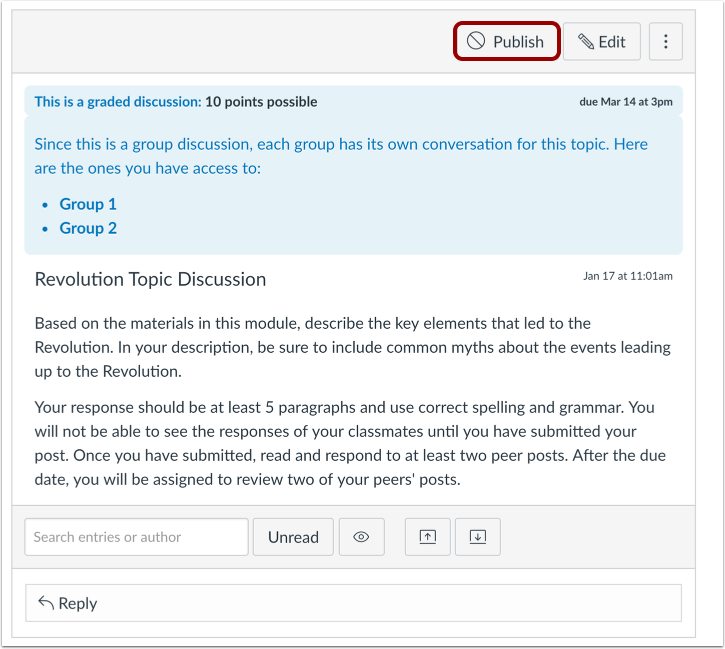 If you prefer to create a group discussion for grading, learn how to create graded group discussions. Note: You will need to create group sets and groups before setting up a group discussion assignment. In Course Navigation, click the Discussions link. Click the Add Discussion button. Enter your topic title in the topic title field. Use the Rich Content Editor to format your content. The Rich Content Editor includes a word count display below the bottom right corner of the text box. Click the This is a Group Discussion checkbox. To select an existing group set, click the Group Set drop-down menu . To create a new group category, click the New Group Category button . To make your discussion available on a specific date or during a specific date range, enter the dates in the Available From and Until fields , or click the calendar icons to select dates. These dates apply to all users. By default, these fields are left blank and the discussion can be viewed throughout the entire course. Note: These fields only apply for non-graded discussions; If you create a graded group discussion, these date fields do not apply. If you are ready to publish your discussion, click the Save & Publish button . If you want to create a draft of your discussion and publish it later, click the Save button . 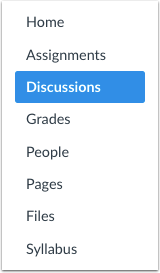 When your discussion is saved in a draft state, you can return to the page and publish it at any time by clicking the Publish button. View the discussion. A Teacher or TA will see links to each group. 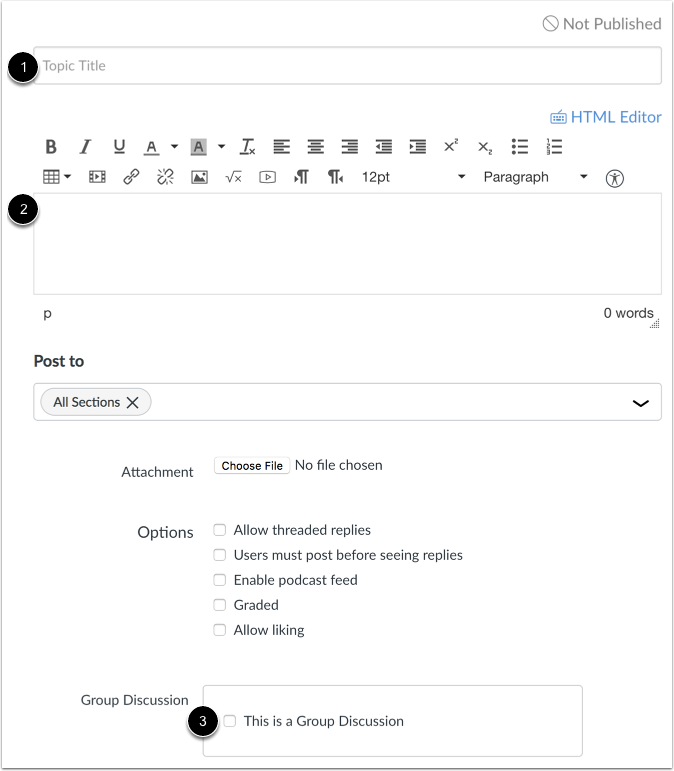 Click the group name to open the group discussion and view replies to the topic. 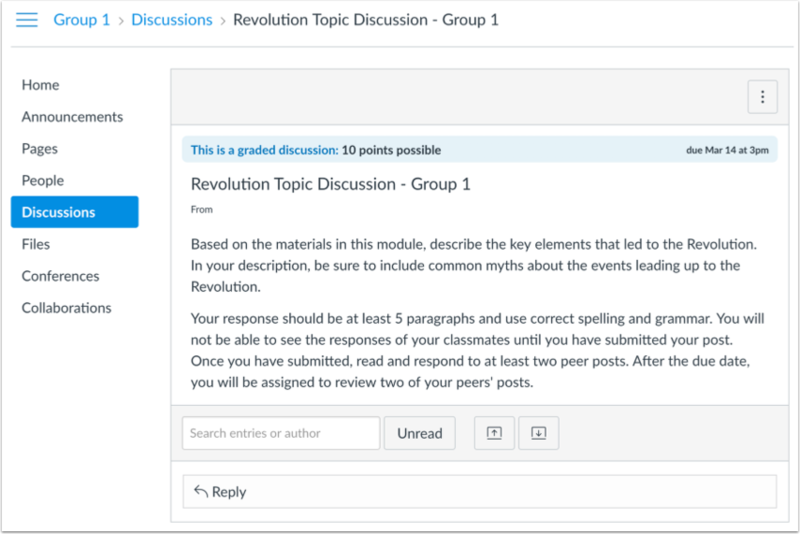 When students open the discussion, they will be taken to the Discussions page within their specified project group to complete the assignment. Note: Discussion posts cannot be made anonymously. Previous Topic:How do I create a discussion as an instructor? Next Topic:How do I duplicate a discussion in a course? Table of Contents > Discussions > How do I create a group discussion in a course?